Oh what a cluttered day and week its been. The joke’s been on me. No time to write or even think so here is another short schedule for the week ahead. This entry was posted in Book Giveaways, Book Reviews, Book Tours and Contests, Books, Dreamspinner Press, eBooks, Fantasy, Less Than Three Press, LGBTQ Audio Books, LGBTQ Book Reviews, LGBTQ Non Fiction, Loose id, M/M Book Reviews, M/M Contemporary Fiction, M/M Fiction, M/M Paranormal Fiction, M/M Romance, M/M Supernatural Fiction, MLR Press, Riptide Publishing, Uncategorized. Sevon Marate is the puppet king of Darkmore (the country of the aisa) and the one pulling his strings is Lord Dominic Ravensgrove. But for Sevon, Dominic is also his lover, advisor and his abuser. Dominic’s plan to capture the shifter land of Priagust leads to the capture of Jack, who turns out to be someone from Sevon’s distant past. As Sevon and Jack begin to bond, will Sevon finally see Dominic’s true face and more importantly will he finally find the courage to stand up to his tormentor…? For anyone who picks up this book, I advise you to read it to the end because looking at this book in its entirety makes it a much better story. Sevon is a deeply damaged character and what is even worse is that he has never felt loved in his living memory. And compounding this fact is the knowledge that Dominic is the one who raised him, who slowly poisoning his mind to the point that Sevon doesn’t remember how to trust. Sevon hides his hurt behind the face of a haughty cruel king but in his innermost thoughts his beliefs are something completely different. This book is written predominantly from Sevon’s POV with a sporadic sprinkling of the POVs of other characters in between. I feel that having the book written mainly from Sevon’s POV was a bit of a pitfall. One, because he knew all about the world of the aisa so he never explains exactly what is what. The author has provided a very helpful glossary at the end but I wished it was in the beginning of the book given how I had to manipulate the entire book thinking that the aisa are the same as vampires and frankly I wasn’t so of the mark. Second, because he wasn’t the most likeable of characters in the beginning and he has a bit of a mental breakdown towards the middle of the book which is quite disquieting but in retrospect it also lead me to have sympathy for the character so that actually kind of worked well. But the problem is I was very tempted to stop reading when all this was happening and I feel many others will be as well but the point I want to make is that the story and plot get better from here on out. Jack is an ungati shifter. I really liked Jack while I hated Dominic from the get go. Jack has this quiet strength about him and when he is being tortured by Sevon and Dominic, I personally took him for a warrior. Somehow his fierce love and determination is what gets Sevon across his indecisiveness and into action. Personally Jack was one of my most favourite characters in this book. Then there are the Armigers, who I really liked. They are like a band of amazons. Bianca is also one of my favourite characters in this book. I loved her strength and determination and the best part was the fact that she was so brave and good. Personally the Armigers were good enough to be the main characters. I loved Bianca, Chaney, Cassandra and Xo and I would love to read more about these four. I must commend the author on her characterizations because even when her good characters do deplorable things she still manages to get the point across that they are the good characters. She has created some pretty strong characters in this book who are sure to stay with you. Since this book is part of a series I was afraid that the final confrontation wouldn’t be in this book but the good thing about the book is that the author completely finishes this arc of the story so that we don’t have to wait for justice to be delivered. Once Sevon takes a stand the earlier pace of this book which is basically like a step forward followed by two steps backward is lost and we get a fast paced plot which is continuously shifting and the story accelerates from peacetime to wartime. The only part of this book which I found absolutely deplorable was the fact that the aisa keep humans as livestock and that just doesn’t sit well in the pit of my stomach but since this fact is only mentioned once or twice in the book, I was happy ignoring it for the rest of the story. Overall the writing in this book is really good with an interesting plot which only lacks a bit of world-building but I guess that will be taken care of in the following books (read post script). But the most beautiful part of this book is its phenomenal characters who leave an impression. P.S. If you are one of those people who hate moving on to the next para without having fully understood the previous one (like me… guilty) I suggest a quick read of the glossary at the end of the book which will quell all doubts. I loved the cover, the light play from sunlight to darkness is a manifestation of the veil and water enhances Sevon’s powers to work the veil. Also well the title is Chasing Sunrise and the cover depicts it quite well. Also the book is quite adequately named but you really need to read all the way to the last chapter to figure out why the book is named so. 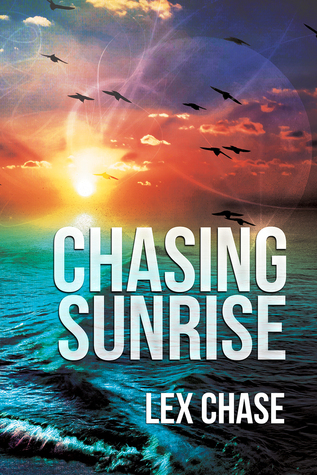 This entry was posted in Book Reviews, Books, eBooks, Fantasy, LGBTQ Book Reviews, M/M Book Reviews, M/M Fiction, M/M Paranormal Fiction, M/M Romance, M/M Supernatural Fiction, Shifters, Weres and tagged A VVivacious Review, author Lex Chase, Chasing Sunrise (The Darkmore Saga #1) by Lex Chase, DSP Publications (Dreamspinner imprint), Fantasy / Horror / Paranormal, first book in a series.